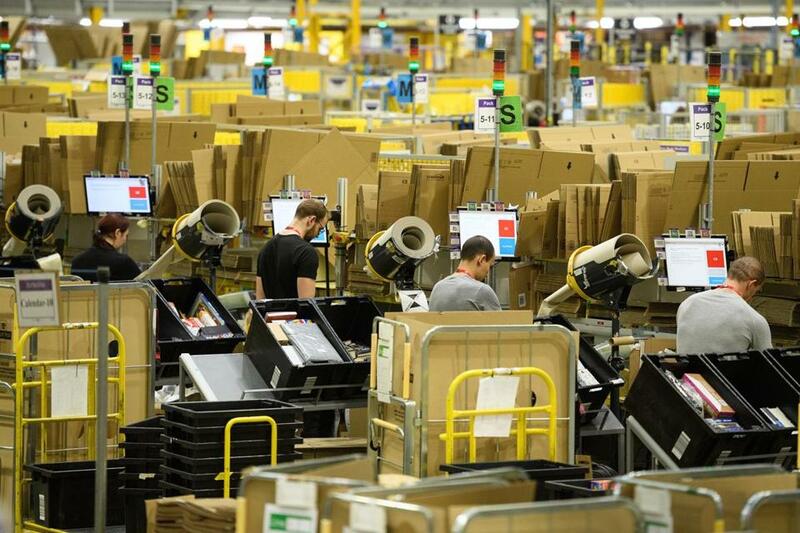 Workers prepared items for shipping earlier this month at an Amazon facility in Peterborough, England. In 2018, one lucky mayor is going to appear at a press conference and announce some really big news: Amazon’s second North American headquarters, dubbed HQ2, is coming to town and bringing with it a projected 50,000 jobs and $5 billion in investment. Last month, I shared my predictions about what will happen if the chosen city is in Massachusetts, or if the state is passed over. And I asked you for your predictions and perspectives. In case you haven’t been following closely, Amazon received 238 bids from cities across North America by its Oct. 19 deadline. “All I can say is, send me a sign [that says] ‘No Amazon Here’ that I can put in my front yard,” Randy Bairnsfather of Winchester wrote. “If the main purpose is for Amazon to hire MIT or other high-level software engineers, let Amazon stay away,” Richard Carlin of Salem, N.H., wrote. “People in those positions will always have an easy time finding a job. If Amazon will create lots of jobs for mid-level college or high school graduates, then let’s welcome Amazon — but don’t give away the farm” in tax incentives. “Attracting Amazon would be a great win for Boston and the New England economy as a whole,” wrote Jeff Solomon, a partner at the Waltham accounting firm of Katz Nannis + Solomon. “If Amazon comes, they will compete with [the online furnishings merchant] Wayfair for personnel, and that will also exacerbate the housing problem,” Peter Flato of Ipswich said. Boston-based Wayfair said recently that it was hunting for new office space to accommodate an additional 10,000 employees — which is not exactly chopped liver. Gordon Jamieson of Arlington believes Boston will win HQ2 because 10 to 20 percent of the employees at Amazon’s current headquarters “will probably be relocated to HQ2” and that those employees might not be thrilled about a new address in Pittsburgh, Baltimore, or Atlanta. Amazon is a company that plays things extremely close to the vest. If we get any leaks about the decision-making process, I suspect they’ll come from government officials or real estate professionals who are boasting that their city is on the short list — despite having signed a stack of Amazon nondisclosure agreements. But a multidisciplinary group of people at the company is now combing through those 238 bids, and all that Amazon spokesman Adam Sedo would confirm is that the company still plans to make a decision in 2018. Beyond that, he had no comment. So, I’m grateful for all the comments you sent along.